I think everyone has a ‘go to’ meal that they cook when they have people over, or if they’re feeling like cooking a safe option. 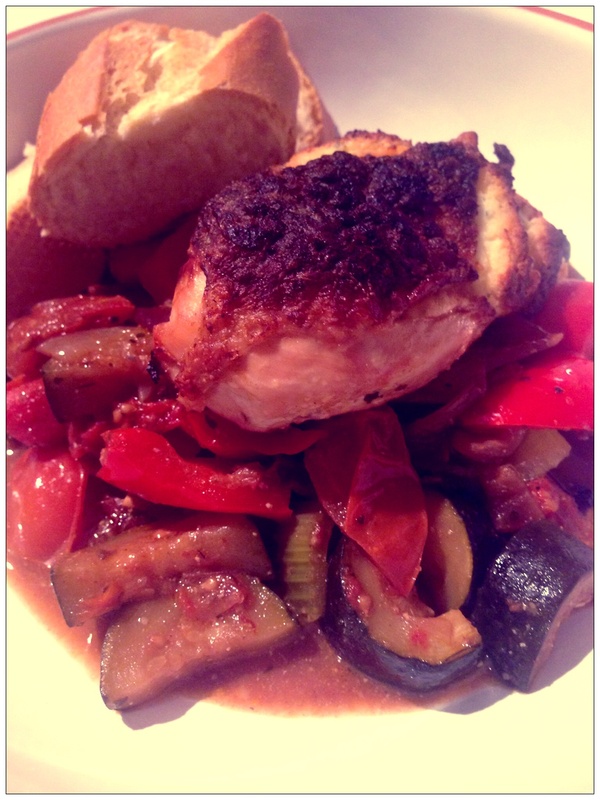 And my dish is Mediterranean Chicken – no idea where I got the recipe, but it’s super easy, tastes great and is quite a convivial dish to cook if you have people round for dinner. There’s lots of chopping and a bit of a saute that you can do before your guests arrive, and then you just bung it in the oven and chop up some crusty bread to serve with it. Then open a bottle of wine and start gossiping! The flavours are classic – it’s basically chicken with Boursin cheese under the skin sat on the top of a chunky ratatouille-type thing. There’s little liquid goes into this dish so you might worry it’ll be dry. It won’t – the balsamic mingles with the juices from the tomatoes and courgettes, along with the chicken juices as it cooks. Preheat the oven to 190C. Loosen the skin of the chicken breasts without removing it, to make a pocket. Divide the cheese into four and stuff one quarter under the skin of each chicken breast so it forms an even-ish layer. Cut the courgettes and peppers into similarly sized chunky pieces. Quarter the tomatoes and slice the celery sticks. Heat 2 tbsp of the oil in a large, shallow flameproof casserole. Cook the onions and garlic for 4 minutes until they’re soft and golden. Add the courgettes, peppers and celery and cook for a further 5 mins. Stir in the tomatoes, sun-dried tomatoes, oregano and balsamic vinegar. Season well. Place the chicken on top, drizzle over the rest of the oil and season with salt and paprika. Bake in the oven for 35-40 mins or until the chicken is golden and cooked through. Serve with plenty of ciabatta or crusty bread. Categories: Chicken, Reidbury Recipes | Tags: autumn, Chicken, classic, Katie's Recipe, ratatouille, vegetables, winter | Permalink. Have always seen this as your ‘signature dish’ since you first flew the nest! Always a winner!